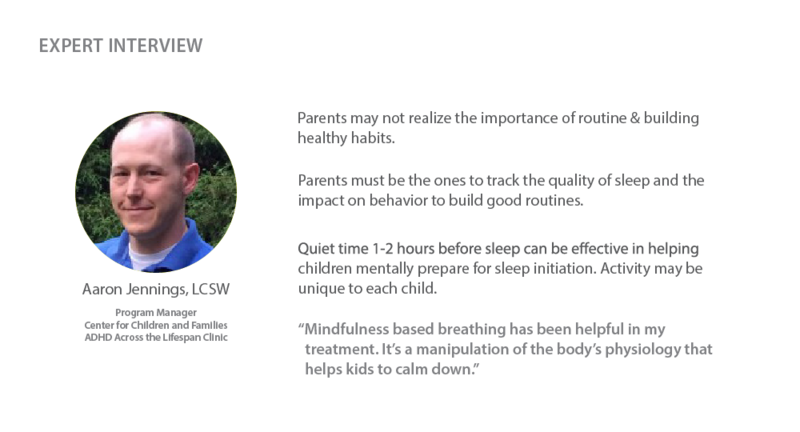 How can traditional individual technology & experience be reframed to support a family experience around sleep health? Challenged with the task of designing for family heath and sleep, we were given a brief to create a design platform that encompassed beyond our mobile screens. Focusing on young families with children, we studied the important role that healthy sleep plays, especially in children as it promotes cognitive, behavioral and physical development. However, parents often face difficulties like hyperactivity, restlessness, and anxiety from their children before bedtime, which make establishing consistent sleep routines a challenge. 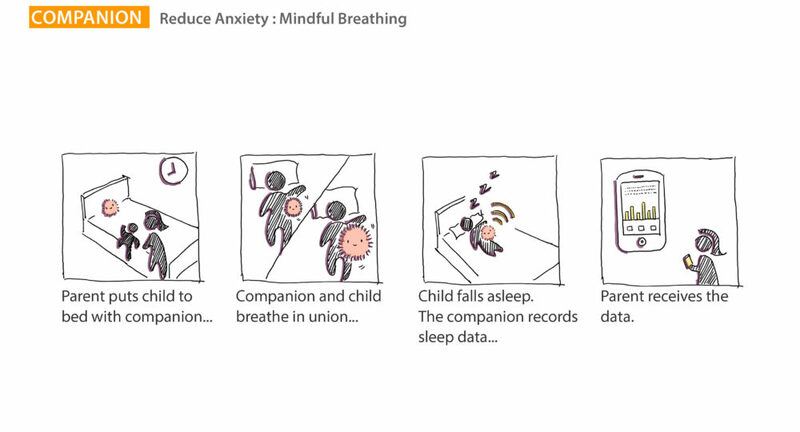 We were inspired by the mindful breathing techniques used by a family we spoke with and Aaron Jennings, the UPMC program manager we spoke with. Additional research showed us that a lot of families are using this technique with their children. Mindfulness meditative practices involve various exercises that help people relax and become more aware of themselves and their surroundings. Hence, we created Aurora, an immersive meditation experience designed to teach parents and children deep breathing techniques through both audio and visual guidance, and a bit of technological magic. Ashlesha Dhotey, Manjari Sahu, Monique Smith, Lisa Li, Willow Hong. Design Research, Analyses, Concept Ideation, 3D modeling, Prototyping, Service Flow, Mobile UI/UX design, Brand language, Motion Graphics, Videography & Editing, Wireframes. around mindfulness meditation for parents and children. During our research with parents with young children as well as with children health specialists, we learned that most children by the age of three begin to “humanize” their toys. Looking at the close attachment that children create with these stuffed animals, we explored ways to center our product as an extension to this bond. We realized that it would be a challenge to build an emotional bond with a brand toy and therefore, we decided that our concept would be most effective when used as an added accessory to a child’s existing favorite stuffed animal. Hence, we created the Aurora belt, a smart toy accessory that would be the central interaction experience, that would bring a child’s dearest toy to “life”. The internal circuit consists of a rechargeable battery that provides power, a pressure sensor that detects hug from the child, and a Bluetooth Low Energy module that enables wireless control from the mobile application. Though not realized, a speaker would also be incorporated in the circuit to produce the audio guidance for the meditative experience. An IR transmitter was also incorporated in the circuit to control the internal projector wirelessly. The belt can be attached to any toy of the child’s liking, making the toy’s breathing come to life. We visualized the material of the belt to be safe grade silicon. 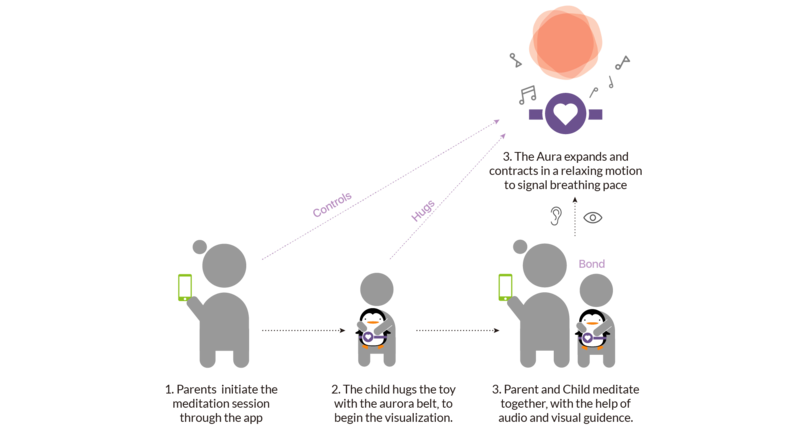 Once the parents have set the meditation experience on the mobile app, the child can hug the toy to activate the projection of the “aura” – the breathing visualization. 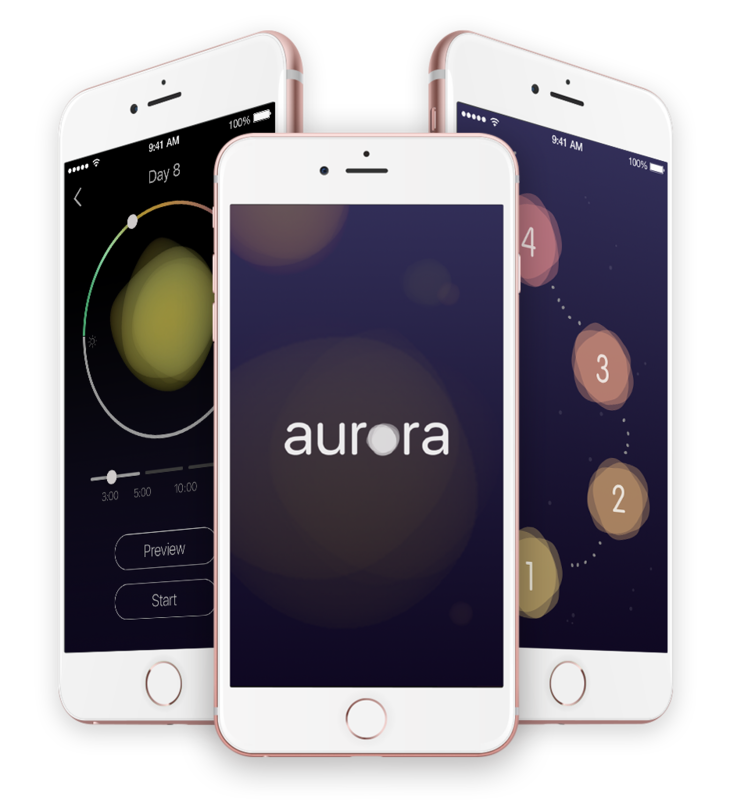 The Aurora app was created keeping the parents in mind. It was designed with two main experiences in mind – to train parents about meditation techniques so that they can ease it into their bedtime rituals with their children, as well as to provide easy customization to the meditation sessions that they have with their children. The first seven days on the meditation journey is designed as the training module for new parents. These sessions are initially brief and are then designed to get incrementally longer. After the training period, the parents can customize the length of each meditation sessions as they wish. They can also control the color customization and audio settings from the app. Guided visualization is a core technique of meditation. It is a relaxation technique which involves the visualization of images that bring a sense of calmness to the body and brain. Schools are also experimenting with meditation programs. For example, schools in Baltimore are teaching meditation techniques to inner city kids, by replacing detention with mindfulness programs. To create an experience which young children could follow easily, we sought to create a simple visualization that could guide them through meditation. The aura, therefore, took a fluid and organic form that children could relate to. The form takes on a circle, the simplest form of sacred geometry, and incorporates the organic quality to make it a living organism. Once the child is in bed along with his stuffed toy and the Aurora Belt, the visualization is projected onto the ceiling. The parents and the child are then guided to breathe in a relaxing pace while focusing their attention on the projection. We found a few categories of geometric patterns that have been scientifically tested or culturally accepted to have meditative qualities. We realized that the fractals and concentric circles were too geometric and were concerned that children wouldn’t relate to them. So we tried to simulate a more organic breathing movement and were inspired by forms like the jellyfish and lava lamp. We then came to this visualization which felt more fluid and soothing. 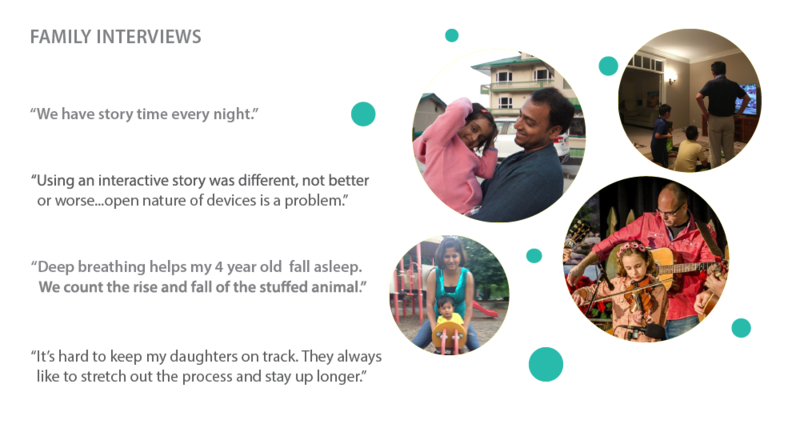 Throughout the design and development process, we conducted six family interviews and two family observations. We observed that the amount of structure provided around bedtime varied from family to family. A parent’s ability to maintain a consistent bedtime routine was largely impacted by their work schedule and family structure. We began ideation with a rapid brainstorming session and led onto to create more concrete concepts from a select few. 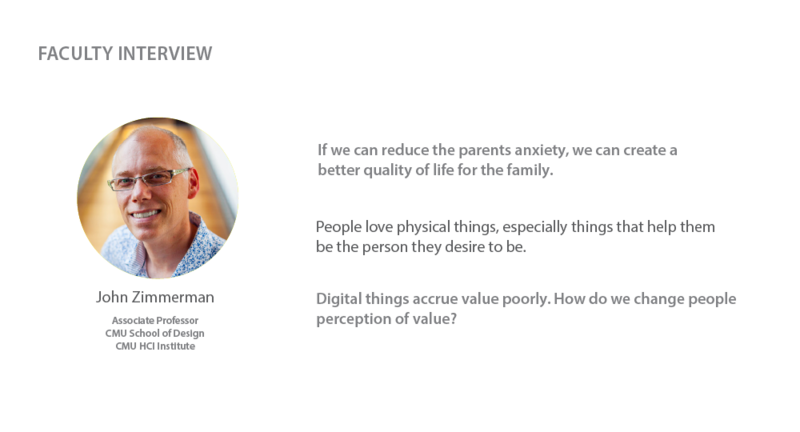 Based on our insights and user profiles, we created four initial concepts that we thought best resonated with our design principles. 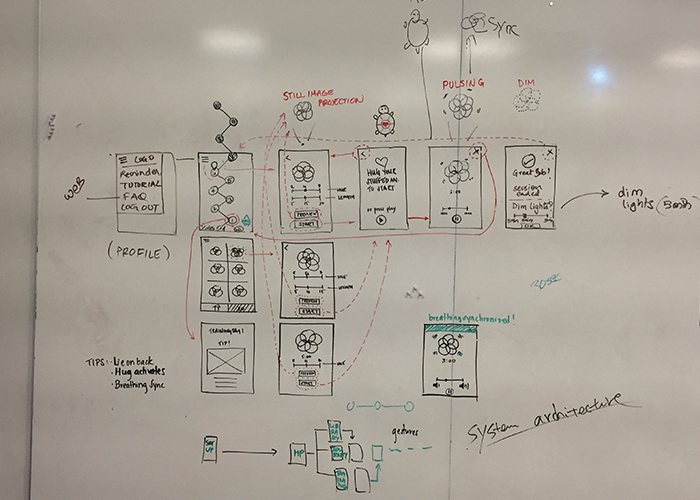 We created storyboards of each concept and shared them for critical feedback with the Philips Design team as well as the parents we interviewed. 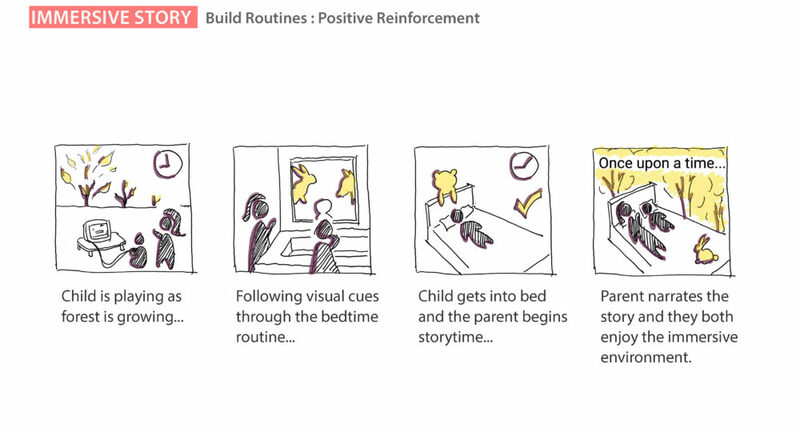 Immersive Story: An interactive & immersive storybook guides the parent and child through their bedtime routine. Once the child is in bed, the parent finishes the bedtime story. Dreamscape: A digital interactive drawing table creates an opportunity for the child and parents to spend some quiet time together in the evenings. The table gradually dims to indicate bedtime. Once in bed, the drawings come to life as the bedtime story. Companion: A companion toy was created that would guide children through deep breathing techniques. 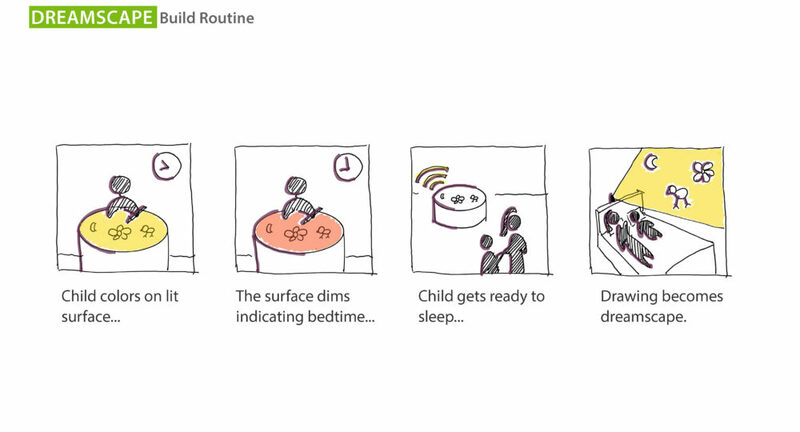 It would also collect sleep data for the parents, which would better inform them of their child’s sleeping patterns. 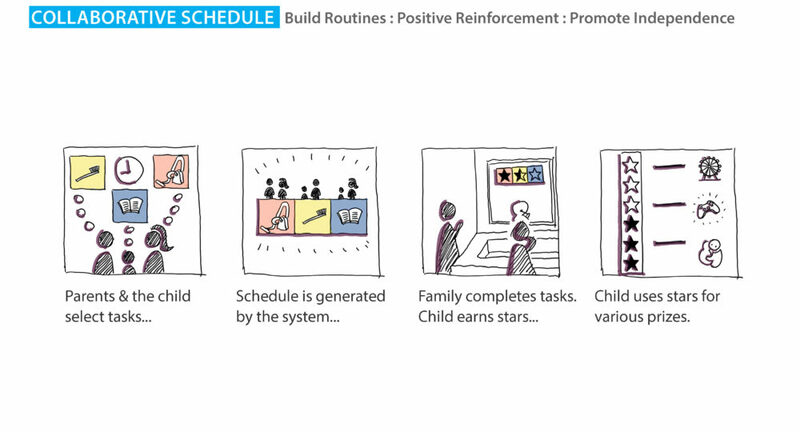 Collaborative Schedule: Parents and child build routines together around bedtime, including chores and incentives. The smart home system reminds the child of his/her tasks and once completed, the child collects stars or reward points which he can use. After the design critique by the Philips team as well as from parent and children reviews, we focused on the companion concept. As a concept, teaching deep breathing & mindful meditation techniques to children and parents for healthy sleep was appreciated. However, there were many setbacks within the concept which we had to reconsider. As a group, we looked at the big drawback of our concept — the emotional bond. It would be a herculean task to create an emotional bond between the child and our “companion” smart toy. We looked at other forms to recreate this eco-system. Our big idea was to not actually replace these emotional toys. 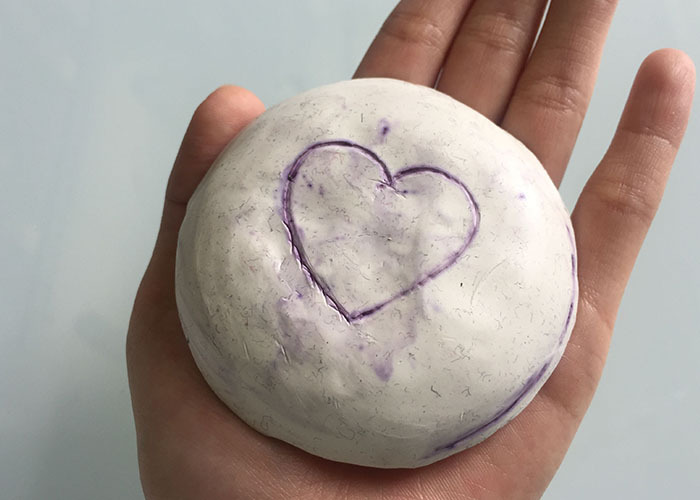 We reframed the problem of how to introduce a companion meditative toy to the children with how can we enhance this emotional bond that the child has with their existing toy and use it in our meditative sleep solution? That’s when we designed the smart accessory. We envisioned our product to be an additional accessory, that can be added to any existing toy the child has. This accessory would then be able to bring that toy to “life”. We also started to envision what functions will the accessory accomplish. We envisioned that the patterns projected out of the accessory are the visualization of the toy’s breathing. When the child hugs the toy, the accessory should be able to take pressure inputs and activate the entire system, which projects out the breathing pattern. An audio function that guides the entire mindful breathing process. Based on the considerations above, the team agreed that a belt form is the best choice for the accessory. We then started to design the belt, aiming to make it children-friendly in both form and materiality. Through research, we found that guided visualization — a relaxation technique that involves the visualization of images, usually calm and peaceful in nature — is a core technique of mindfulness meditation. Traditionally mindfulness meditation requires imaginative visualization. In order to make this process less daunting for a child, we decided to bring a tangible form to the technique of guided visualization. We were inspired by the Apple Watch application “Breathe”, and decided to use contraction and expansion of the visual cues to represent the breathing effect. 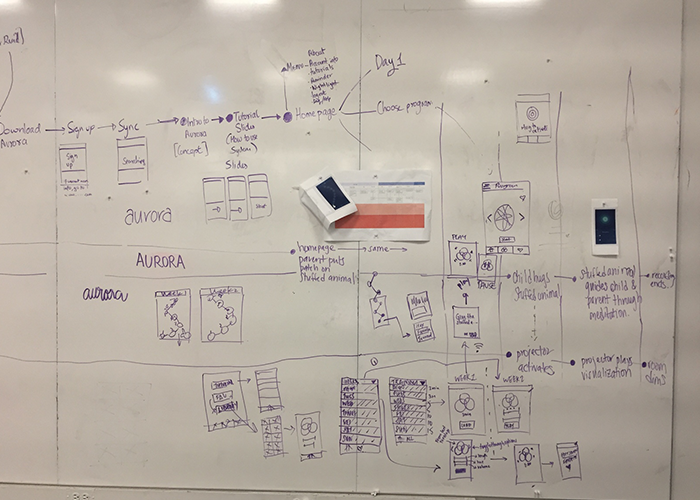 We developed prototypes that hybridized different types of visual languages and analyzed their pros and cons. Yantra is a sacred geometry from Indian culture, and it is also a fractal. The form inherits the concentric and symmetrical characteristics of the sacred geometry, with a moving pattern that is similar to organic objects. The form takes on a circle, the simplest form of sacred geometry, and incorporates the organic quality to make it a living organism. Inform them of the eco-system and introduce the parents to mindful meditation techniques through a seven-day training module. 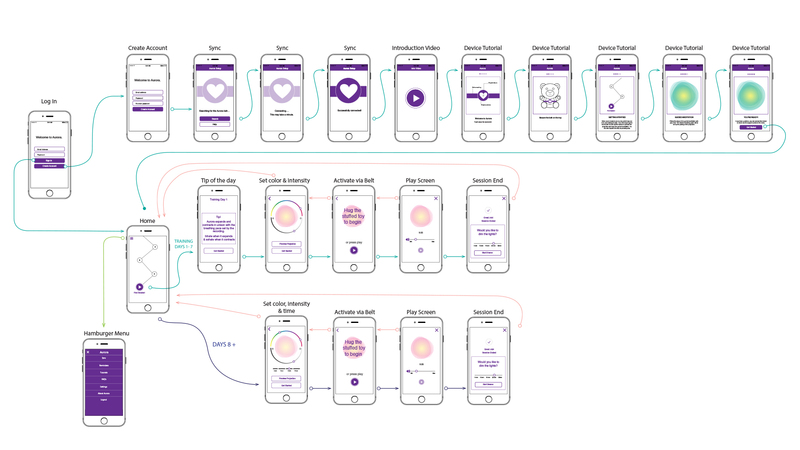 The main UI design language for the app component of this system is driven by the visualization of the aura. We tried to keep the overall color theme dark because the app would be regularly used during night-time with dim lighting. In the first few iterations, we struggled to find a UI design that balanced well between the two different styles of auras: one was very geometric while the other was more organic. As we later decided on the organic circular form of the aura, our design language also followed its aesthetic principles. We tested our prototype with a family who have a 4-year-old boy. This experience was crucial as we not only got to engage in the reactions of the parents to our service & product but also that of the child. The design language of the aura resonated with the child and he was excited to experience the “breathing” of his toy. Once he was adjusted to the belt, he tried it on many of his toys to experience their “breathing”. The breathing exercise was practiced by both, the mother and the child. They were both able to follow the aura visualization as well as relax during the experience. The mother’s participation in the experience was an essential role as the child looked up to her for guidance several times. 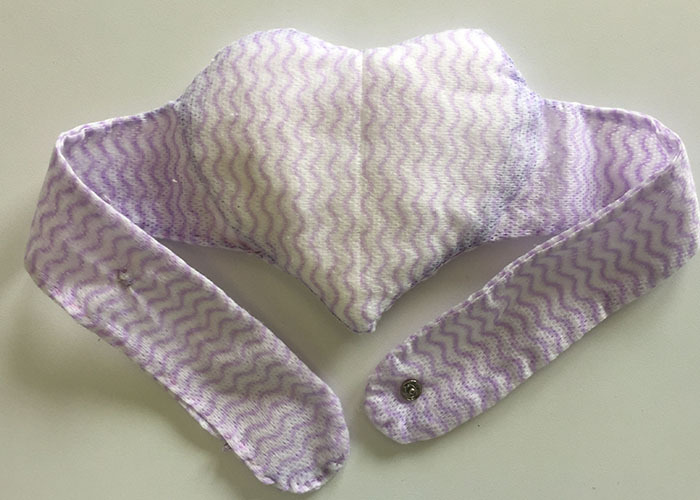 Initially, the child was hyperactive and excited when we showed him the Aurora belt, but after a session of mindful meditation, he showed signs of rest and relaxation. From our user testing, as well as from feedback from the Philips Design team, we are researching more on breathing patterns and rhythms. We want to explore on different breathing techniques that are ideal for various age groups. Future considerations of the service would have a wider variety of visual breathing explorations, that can be customized by the user. Another component that we see being implemented in the future is data tracking. By adding sensors in the belt, parents can track their children’s sleep cycles and study what meditation techniques work best fo their child. An alternative to the existing projection can be considered.Because it is currently placed in the belt, the toy needs to be held in a restrictive way for viewing the projection. A third party projector would be more feasible for optimal viewing of the Aura on the ceiling.